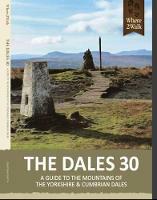 The Dales 30 are the highest mountains within the boundary of the Yorkshire Dales National Park, the accepted criteria being 2000ft in height with a minimum 30m (98.4ft) drop on all sides. The famous Yorkshire Three Peaks are all in the list along with some less popular mountains such as Randygill Top and Lovely Seat. However this is more than a traditional guide book. Jonathan has included a large number of attractive photographs spanning the seasons; he has described the climbs in an honest and at times humorous manner and has added many more facts and information about walking in the Dales. Some outside experts have also contributed their own special stories of the area.